Bowness Knott is a familiar site to anyone driving into Ennerdale, with its impressive western crags looming over the road that runs to the car park at its foot. From this angle the fell looks almost impossible to climb, but there are easy approaches from both west and east, and the view from the top is well worth the effort required to get there. Bowness Knott is a rocky outcropping on the southern side of Great Borne, forming part of a line of harder rocks that run from Anglers Crag across Bowness Knott, Brown How and the top of Great Borne itself and emerging again in the Buttermere valley at High Ling Crag and Rannerdale Knotts. It stands far enough away from its parent mountain to justify including it as a separate fell, although it isn't quite as separate as its impressive western face might make one believe - the high level link between Bowness Knott and Great Borne is too far back to be seen from the valley bottom. Bowness Knott is protected by its crags to the west and south and forestry to the east and partially to the north. There are two practical lines of ascent. The Wainwright route starts where Rake Beck crosses the road. A network of paths run up the open ground between the beck and the start of the forestry. As we approach the rocky slopes of Brown How look for a stile crossing the fence to the right (sometimes in poor condition). Beyond the fence the path climbs up towards a former forest, where the route is now quite tricky to pick out (but still passable). This path curves around the back of the crags and eventually approaches the summit from the north-east. The second route uses the forest roads. There is a small quarry near the summit, and that route is used on a fairly regular basis (including by the Wild Ennerdale group during our Juniper planting expeditions to the top). Forest roads are a fairly changeable thing, but this route is fairly straightforward. Follow the forest road from the Bowness Knott car park as it heads up the valley. Leave the road to follow the Smithy Beck waymarked trail. At Smithy Beck itself the official route now heads back down the stream to the lake. Ignore this and cross the footbridge over the beck (just below a nice waterfall). On the far side climb up to a rough track - turn left onto this track and follow it to a forestry road. Follow this road as it runs uphill alongside Smith Beck (now running in a hidden ravine). This eventually brings us to a bridge over the beck - cross the bridge and follow the road as it curves around to the left then heads west, climbing gently, all the way to the quarry. A rough track passes the quarry to the right - follow this uphill till it runs out then head uphill across country to the summit. We currently have no walks that reach the top of Bowness Knott. The summit is a pleasant area of undulating rock and heather. Beware of the crags which start very close to the north and west of the summit area - great views down to the lake can be found by carefully heading west from the top of the fell. The view was once threatened by growing timber, but those trees have since been fells and so the top now offers a great view into the heart of Ennerdale. 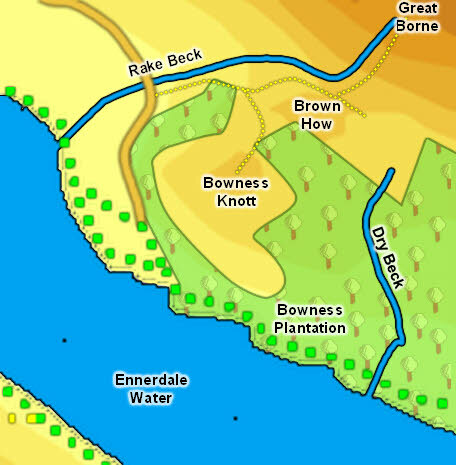 The eastern border of Bowness Knott is formed by Dry Beck, which runs fairly straight down from Great Borne into Ennerdale Water. Rake Beck forms in the crags of Great Borne, flows south towards Brown How and then turns west and flows around the northern and western shores of Bowness Knott. To the south Bowness Knott runs down to Ennerdale Water.